Types of wines: Medium-bodied, both dry and sweet, red wines, as well as slightly effervescent to fully bubbly reds. 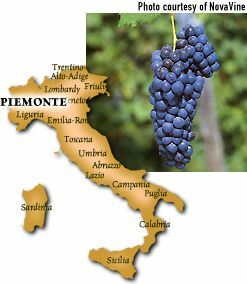 Origin: Mostly central Piemonte, around the town of Asti. Description: Whether dry or slightly sweet, with or without some level of natural carbonation, Freisa offers a cherry-red color with bright aromas and flavors of wild red raspberries. Aging: At its best Freisa is consumed young. However, in the hands of a capable and daring winemaker, oak-aged versions can improve for up to five years. Best location: Hot days and cool, foggy nights and mornings enhance the grape's natural acidity and intense fruitiness. FastFoodFacts: Freisa's racy acidity makes it perfect for foods with high fat content: triple creme cheeses, salami, sausages, etc. Can also be used to add acidity to a wine-friendly salad dressing.